This Coq au vin Chicken Pie recipe turns the delicious French classic chicken dish into the ultimate comfort food. 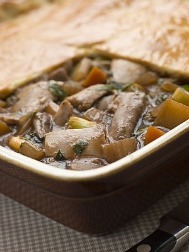 I'm always on the lookout for something new and this combination of pie and coq au vin sounded yummy. Coq au vin, pronounced kohk-oh-vahn, is a very classic French dish that includes chicken, bacon and wine. This recipe does take a bit of prep work so you do need somw time available. Enjoy the savory richness of this wonderful winter warmer. Get a pot of water boiling and put the pearl onions into the boiling water for 15 minutes then drain. The skins should slip off easily and leave the root end intact. Melt 30ml butter in a large heavy-based pot and add the chopped red onion. Cook over low heat until tender - don't brown them. Remove the onions from the pot with a slotted spoon and drain on some kitchen towel. Cook the bacon in the pot and then place on kitchen towel. Combine the flour, paprika, salt and pepper in a bowl, and toss the chicken strips into the mixture. Shake off any excess flour and brown the chicken in the same pot for a couple of minutes. Add the onion and bacon to the browned chicken in the pot. In a separate pot, melt the remaining butter, add the pearl onions and sprinkle with the sugar. Allow the onions to caramelise gently until they are a lovely brown colour, then add to the chicken. Add the mushrooms, carrot, beans, wine, stock and olive oil. Add the bay leaf and the thyme, and allow to boil. Once boiling, reduce the heat, cover with a lid and simmer until the liquid has reduced, about 20 minutes. Preheat the oven to 180 C.
Put the mixture into a 60cm x 40cm pie dish and allow it cool before you cover it with pastry. Sift the flour and salt into a large bowl, and add the herbs. With gentle fingers rub in the butter until the mixture resembles breadcrumbs. Mix the egg yolk with the water and add half of the egg mixture to the flour mixture. Using a knife, slice into the mixture to combine and then form a firm dough with your hands. You may need to add more water, but try to keep the dough as crumbly as possible. Roll the dough out onto a lightly floured surface. It should be big enough to cover the your pie dish. 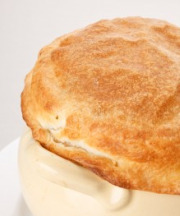 Spread the chicken mixture evenly in the pie dish and cover with the pastry. Use any leftover pastry to decorate the pie with leaves or any shape you prefer. Brush with the egg and place in the fridge to let the pastry relax so that it doesn't shrink, about 30 minutes. Bake the pie until the pastry is golden brown, about 25 minutes. My favourite way to serve this Coq au vin chicken pie is with creamy mashed potatoes and baby peas.